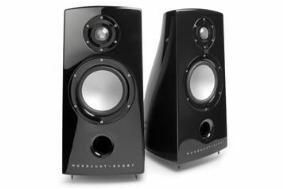 BRISTOL SHOW 2010: First UK outing for Mordaunt-Short's P2 speakers | What Hi-Fi? The predictably easy on the eye speaker is the new compact addition to the Performance range. It uses the same ATTTM aspirated tweeter and elongated metal diffuser as on the rest of the Performance family but with a chassis just 24cms tall. Not just a pretty face, the cabinet is made from an updated version of the original polymer resin material with 'subtle modifications' to the internal structure. A 6.5in aluminium woofer and a 1in dome tweeter combine to deliver a claimed frequency range of 48Hz to 30kHz. The Mordaunt-Short Performance 2 speakers are on sale now for around £2700. Marantz is giving the Mordaunt-Short Performance 2 speakers their first UK airing in its Bristol demo room. But that's not all. Marantz Brand Ambassador Ken Ishiwata has flown in to the UK specifically to host the Marantz demo. Ken is partnering the P2s with the Marantz SA-15S2 SACD player and PM-15S2 amplifier. He's also showing and discussing his 30th anniversary KI Pearl system. And to accompany the KI Pearl electronics display, a limited number of KI Pearl books – which Ken will be happy to sign – are on sale. Show visitors can also hear the Award-winning Marantz CD6003 and PM6003 CD player and stereo amp, as well as the M-CR502DAB mini system.